Atlantis readied for final mission to service the Hubble Space Telescope. Endeavour's dual preps for standby rescue craft and June construction flight to space station. A new military satellite so highly classified the U.S. government will not even divulge which military or intelligence agency owns it is undergoing final checkout for liftoff this summer at Cape Canaveral. The placement into the Cape Canaveral Air Force Station's launch schedule of the $500 million class secret mission, on a large booster and close to launch - but with no public disclosure of who will command it - is highly unusual. The satellite weighs at least two tons and is code named "PAN." United Launch Alliance, a joint venture between Boeing and Lockheed Martin, had reserved July 17 for the Atlas 5 mission. However, the flight is expected to be pushed back at least a few weeks due to delays encountered on Atlas missions ahead of the PAN launch. The Atlas 5 has routinely launches military payloads into geosynchronous transfer orbit, Molniya-type elliptical orbit or more circular medium altitude orbits. Which orbit PAN will use is not yet publicly known, but will be determined by civilian analysts after launch. The Atlas being used is a 401 version with no solid rocket boosters and a single-engine Centaur upper stage. The mission is part of a surge in military spacecraft launch operations at Cape Canaveral, which has already launched three military flights in 2009. The Cape is to launch as many as five more during the second half of the year starting with PAN. The late placement of PAN in the public schedule, minus any other information, could signal that the Defense Dept. and intelligence agencies are beginning to stiffen secrecy around the growing number of U.S. military space flights. This increased U.S. milspace activity is occurring at a time the U.S. faces increased geopolitical and terrorist threats around the world. New foreign military space programs, like China's, are also beginning to mature. Space intelligence demands are also growing rapidly in both Asia and the Middle East. Military and intelligence rocket scheduling has been relatively open for most of the last 20 years at least relative to targeted launch date and mission ownership. The PAN designation is likely a meaningless term used simply so the mission can be called something that will not give away its identity during integration with the launcher. The National Reconnaissance Office (NRO) has used phony mission designations for years at the Cape. But the NRO and U.S. Air Force have for years also announced when their payloads are being launched. The Defense Dept. acknowledges openly that the NRO manages imaging, signal intelligence, and ocean surveillance missions and their relay satellites. The Air Force operates communications satellites and missile warning spacecraft. In addition the Missile Defense Agency is openly launching new spacecraft to develop advanced warning sensors while the Defense Advanced Research Projects Agency is developing technologies that aid all of the agencies. DARPA, based near Washington D.C., did employ extensive secrecy in its Mitex twin satellite mission launched from the Cape to directly inspect other satellites in geosynchronous orbit. This is the most ambitious mission launched to date as part of a major new USAF space situational awareness program. Mitex, launched on a Delta 2, also employed an advanced solar array equipped upper stage developed by the Naval Research Laboratory. DARPA said before launch this flight would investigate new technologies�but rendezvous operations in geosynchronous orbit were never mentioned. During the 1960s and 1970s secret unmanned flights were often unannounced and in the mid 1980s, several military shuttle missions were launched with no identification of payload affiliation. The Central Intelligence Agency has acknowledged in Congressional testimony that it is improving satellite communications with its covert agents. Whether that highly classified task is part of PAN's mission will never be discussed openly, but could fall in a mission class not directly involving the NRO or military services. Virtually all U.S. military and intelligence programs are in the midst of hardware upgrades and in some cases entirely new spacecraft developments. That has resulted in a major increase in U.S. military satellite launch operations at both Cape Canaveral and Vandenberg. The Cape, and the adjoining Kennedy Space Center, will be extremely busy during the second half of 2009. Six missions have already been launched this year including two shuttle flights and the Kepler observatory satellite on a Delta 2. Three more shuttle flights are planned by years end. Three military spacecraft have also been launched including USAF GPS, and Wideband Global Satcom missions, along with a massive NRO eavesdropping satellite launched in January on a Delta 4-Heavy. The Atlas 5 will be used extensively during the second half of 2009, including for the NASA Lunar Reconnaissance Orbiter flight planned for launch June 17 and the NASA Solar Dynamics Observatory planned for October 14. NASA also hopes its first unmanned Ares booster test by this summer or fall. 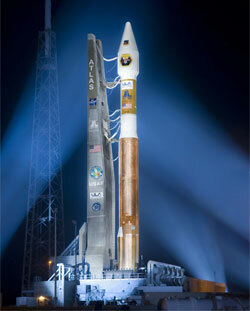 NASA will also launch a new GOES geosynchronous weather satellite atop a Delta 4-Medium Plus launcher on June 26. Military missions make up the largest mission share for the rest of the year, however. A Delta 2 carrying two Space Tracking and Surveillance System (STSS) satellites for the Missile Defense Agency. A Delta 2 carrying the USAF GPS 2R-21 satellite. 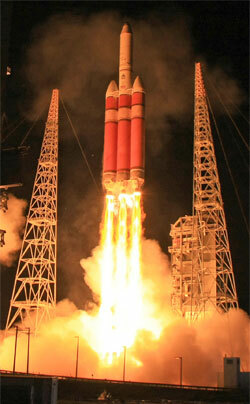 A Delta 4 carrying the third USAF Wideband Global Satcom. 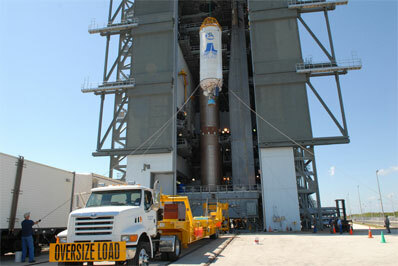 A Delta 4-Medium Plus carrying the first large new GPS 2F spacecraft. Vandenberg will also launch an Atlas 5 this summer carrying a Defense Meteorological Satellite Program spacecraft and a Delta 2 carrying the DigitalGlobe WorldView 2 satellite, a dual use military/Civil imaging spacecraft.